Emphasis on TEACHING. Many professors teaching this course are attorneys first and academics second. They do not have a lot of time to prepare or think about how to apply this information effectively for their business students. 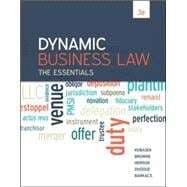 Dynamic Business Law: The Essentials contains a helpful instructor’s manual, particularly for the many adjuncts teaching this course. Emphasis on CRITICAL THINKING. Neil Browne, one of the co-authors of this text, has written a successful text on critical thinking. His framework is included in Dynamic Business Law: The Essentials as well – to help students learn how to frame and reframe a question/issue. Critical thinking questions are also included at the end of each case, to tie in this component even further.